Peoples Armed Police There are about 2 million police in China. Many of them operate out of small offices that serve communities of around 10,000 people. Typically police show up for work at 8:30 am and slide marker into a slot to show they are on duty and wait for local people to come by with complaints. The police in China are generally poorly paid and ill trained. They are regarded with suspicion by ordinary Chinese, particularly in rural areas. Police have traditionally been more involved in maintaining government control than solving crimes. Family members of crime victims often become infuriated with police for their incompetence and unwillingness to make an effort to solve crimes that affect them. Police have traditionally been tough and conspicuous. One Chinese school teacher told the New York Times, “You know in China the police are the most frightening thing.” Their impact is felt even when they are not around. A National Geographic photographer said, "But usually there's no need for lots of security. There' an implied authority in the air that make people behave." Chinese police have a reputation for being corrupt. "In America," one Chinese man told the New York Times, "you know what's illegal. Your laws are clear. 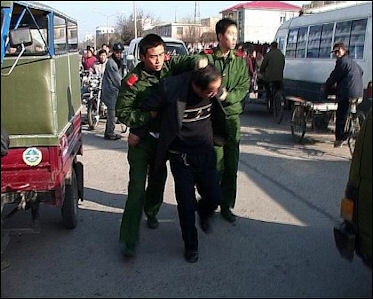 Not in China, the police they're the worst of them all. They're linked to the smugglers too. 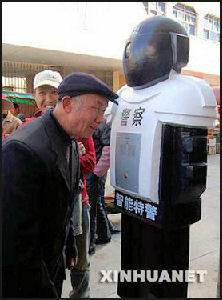 China is a crazy country now." Figures released in March 2011 show that the official domestic security budget has outstripped the military's for the first time. 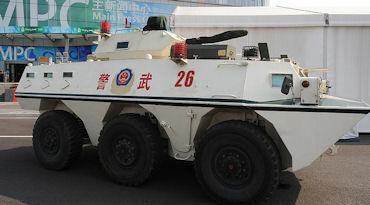 Spending on law and order will rise to 624.4bn yuan ($95 billion) in 2011, while the People's Liberation Army will receive 601.1bn yuan ($91.5 billion). China's total spending on domestic security was 514 billion yuan ($76.7 billion) in 2009, a whisker below the military budget of 532 billion yuan, a group of social researchers from the elite Tsinghua University in Beijing estimated in a report published earlier this year. Nicholas Bequelin, a researcher on China for Human Rights Watch, an international watchdog group called the resources devoted to stability "absolutely humungous." "There's a vicious circle that more security leads to more security," he told Reuters. The amount of money spent on internal security “shows the rising costs of maintaining internal control ... This system is very sensitive to any instability or contention," Xie Yue, a political scientist at Tongji University in Shanghai who studies domestic security, told The Guardian. The public security budget was raised by nearly a third in 2009 to $4.2 billion in part to address concerns about unrest in Tibet and western China and trouble brought about by unemployed workers and other problems associated with the economic crisis in 2008 and 2009. 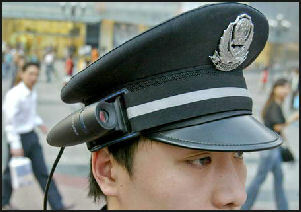 In December 2008, China’s 2 million police were given the assignment to fan out across the nation and listen to complains by residents. The aim it seemed to make sure there were no disgruntled citizens around when China celebrate the 60th anniversary of Communist rule in October 2009. In December 2009, a policeman that died after drinking too much at a banquet he was made to attend, was named a martyr who died in the line of duty. According to the China Daily, the traffic officer, Chen Lusheng of Shenzhen, passed out on a couch after a round of toasts and suffocated, Labeling him a martyr was apparently done so his family could claim compensation. PAP training Most police stations lack cars, even cameras, let alone advanced equipment such as computers, lie detectors and fingerprint sensors. In some places finger-cuffs are still used instead of handcuffs. Western-style, scientific investigations are rare. Most police forces lack the resources to carry out such inquiries. Farmers complain they must pay the police to get them to investigate murder cases. Junior military police offices sometimes have their knees bound with tape to improve their posture. As part of their training, cadets in special anti-terrorist squads have a motorcycles driven over their chest. The secret to performing such feats is using 3,000-year-old martial arts breathing methods. In the mid 2000s, the Chinese government said that it would start taping police interrogations to prevent forced confessions and the use of torture to extract confessions. The move was made after a highly publicized case involving a man that was imprisoned for murdering his wife for 11 years and was released after his wife turned up alive. The man had been tortured to extract the confession. After he was released a declaration of innocense from his arresting officer was found written in blood on a tombstone. The officer hung himself. As part of an operation called the Gold Shield Program, the Chinese government has collected digital data on 1.2 billion of China’s 1.3 billion people. Already there are concerns that corrupt officials have been selling the data to marketing companies. Recent divorcees say they get unsolicited calls from matchmakers. Other people complain they get calls from telemarketing companies that know the licence plate numbers of their cars and the birthdays of their children. More than 500 cities have established Internet police bureaus. See Internet. "Operation Strike Hard," launched in 1996, was a government crack down on corruption, organized crime, smuggling and other crimes. It led to 3,500 executions in 1996 alone. Among those put to death for corruption and Triad-connected crimes was the former governor of Guizhou. In November 2006, the Chinese government announced that broken up more than 1,300 criminal gangs many of which had previously been protected Corrupt officials are believed to be the biggest obstacle to fighting organized crime in China. Street vendors in Guangzhou do a brisk business selling switchblades, metal rods and other devises intended for protection. When the mayor there told police they needed to get tough on crime, using their weapons f necessary, the police responded by shooting fiver mugging suspects. The campaign has been led by Shi Yi, deputy director of Wuhou district police station in Chengdu, who runs the microblog website. "Police working hours are not stable, and they don't have much free time. They don't have time to look for a girlfriend," he told local media. Initially, Shi has put forward five hopefuls in their mid-to-late 20s, most of them from other provinces of China. The squad has notched up 38,771 followers in the first two weeks, though there is no information on the gender breakdown of their admirers. Female fans have turned up at the police station hoping to meet the officers. 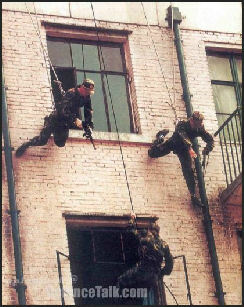 The site shows glossy photos of each guy at work above a caption asking readers to "rescue" them. All have macho microblog names, such as Ice, Snake and Rocky Priest. Two from Wuhou's armed response unit are pictured toting guns. Each officer has his own Twitter-style Weibo account to chat with admirers. What goes on there is private, says Shi. "We don't control their personal life. How could you control their dates? It is their choice," he said. However, should any of his men get serious, "they should tell us once they have a girlfriend". Any marriages will be publicised, he promises. Clean-cut officer Wang, aka Rocky Priest, is a traffic cop who presents himself as solid husband material, saying: "I can't change the world, but I can change the traffic on Third Ring Road." More romantically, his tweets hint at a broken heart: "Today is my first girlfriend's birthday. Although she is married, and we don't contact each other, I want to send her my best wishes. Thank you for your company during my younger years." The 27-year-old from coastal Jiangsu province says he has been single for a year. He confesses to missing his parents, and hopes to find "an open-minded girl to marry". He has 10,443 followers. Wuhou is the first public security bureau branch to launch a microblog dating service. The attention has left Shi bashful about talking to the media. "I did not realise this event could gain so much attention. We just want to help them to find girlfriends," he said. He shrugs off any fears his officers might abuse their fame. 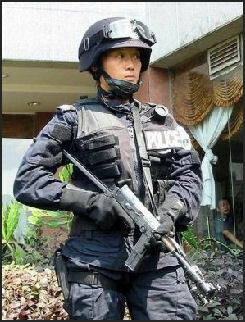 "Those five policeman are mature, stable and responsible guys. It is not possible they will become womanisers," he said. "They are already so busy with work. They won't have time to go out for many dates." If anything, he expects the avalanche of publicity to make them "more careful about their behaviour".